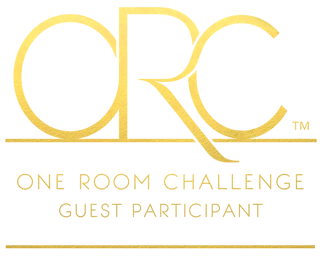 It’s already week 3 of the One Room Challenge, and it’s been a quieter week over here. Between Easter weekend, dealing with life with two kids 3 and under, and our contractor being away, we’re in a little “lull” with hands-on projects this week. But we’ve been working on gathering up lots of materials and projects for the next weeks! 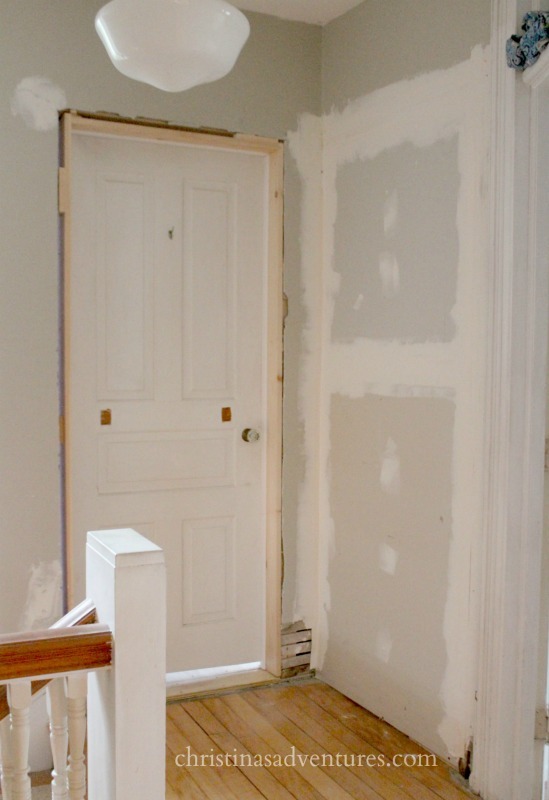 We have detailed and chunky wood trim in the rest of our house, but we didn’t have it in the bathroom or the kitchen. 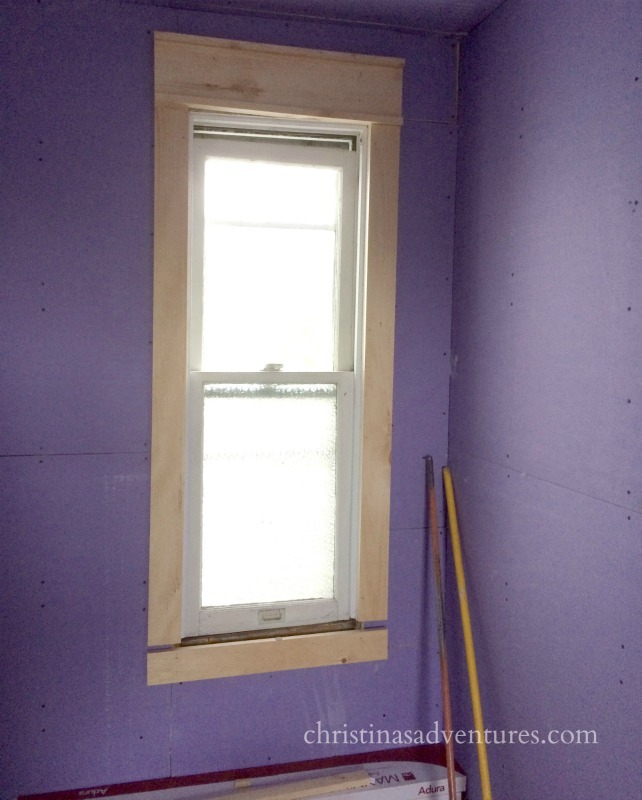 We installed this easy craftsman-esque wood trim in both of those rooms – we love it because you don’t need to do any angled cuts, and it’s made out of all flat pieces of pine. Simple, budget friendly, and looks really good! The old windows are still in there…we’ll be getting our new windows installed sometime in the next two weeks. 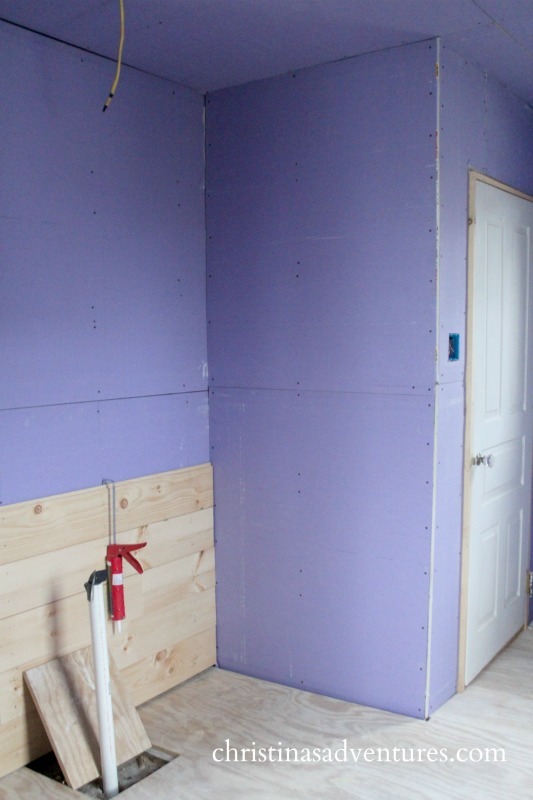 All of the electric work is ready for lighting…the plumbing is ready to go, and the floors have been leveled. So many of the required pieces that we couldn’t do are behind us…and now the fun is beginning! We got our flooring delivered a few days ago (this is the flooring we’ll be using – we loved it in our previous and current kitchen). I can’t wait to start installing it tomorrow! I started putting our shiplap on our walls (behind where our bath is going to go). My poor husband kept cringing – I think my lack of depth perception was really affecting my ability to hit the nail 50% of the time 😉 Ahh – DIYing as a couple is always an adventure! BUT our contractor is away for the week and he left us his nail gun – hooray! It’s going to go SO much faster now! I feel like now is when the fun starts – we are able to get working at this phase! Fun stuff is ahead – make sure you’re following on Instagram to get all of the behind the scenes glimpses. Those window frames are looking great so far. They are awesomely chunky and add a great design element to the space. So excited to see more. Love it so far! especially the window trim. Are you keeping the purple??? Ha! I knew I forgot that in the post…no way! 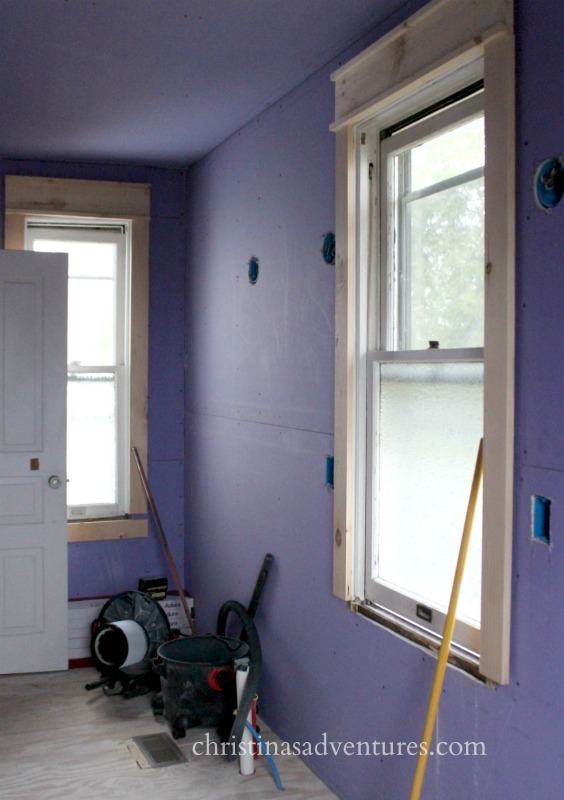 🙂 It’s just the drywall that you’re supposed to use in a high-moisture room 🙂 We’re working on putting shiplap up on it already! 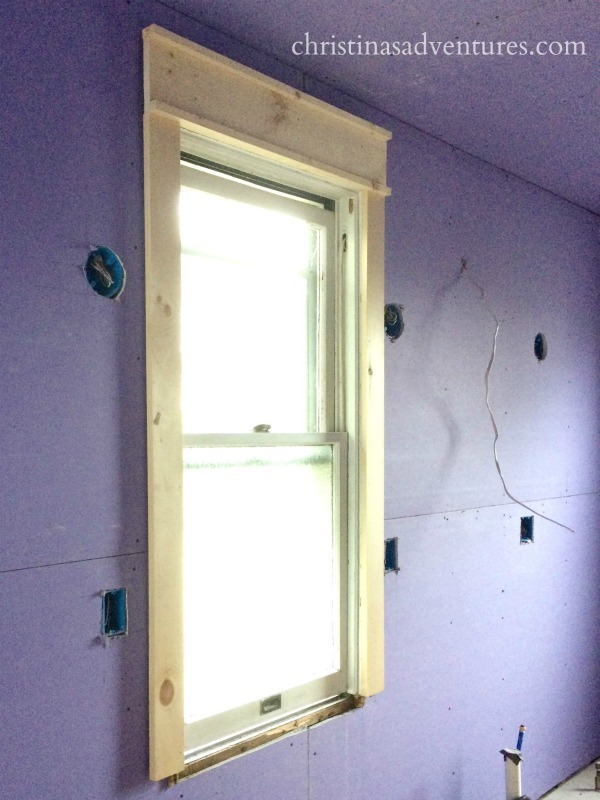 The room is looking great – I love that chunky window trim! Thanks so much, Carrie! Can’t wait to share more soon!